This heart rate monitor not only shows calorie and fat consumption but it will also show your average and maximum heart rate. A perfect heart rate monitor watch for beginners or anyone on a budget, This heart rate monitor (HRM) offers quality and value. 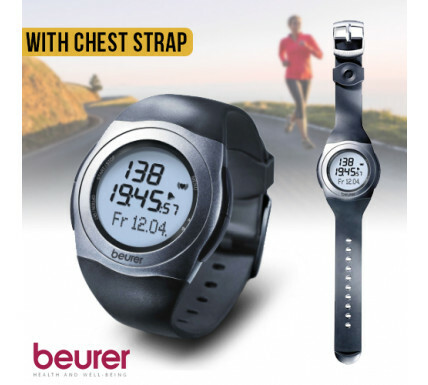 The extensive range of features included with the Beurer heart rate monitor wrist watch allows you to accurately monitor your heart rate during training and set individual training zones. Once you have set the training zones the heart rate monitor will alert you if you are below, within or above the zone. Also, displaying the essentials; date, day and time, the heart rate monitor wrist watch has alarm clock and stopwatch functions. As replacement for the Oregon Scientific Smart Trainer Heart Rate Monitor, the stylish and slim unisex design of the Beurer heart rate monitor watch makes it ideal for everyday wear and this HRM is super lightweight at only 47g!